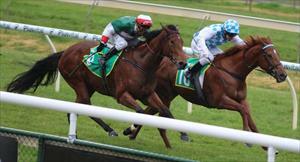 Spanks showed she still has plenty to give with victory at Bendigo on Thursday. Settled in second place by apprentice Liam Riordan in the Benchmark 58 Handicap over 1400m, Spanks was always travelling sweetly and found plenty in the home straight, running down Desimaan to score going away by half a length. Riordan said the daughter of Magic Albert always felt like the winner. “She jumped well and then she settled nicely for me just off the leader,” Riordan said. “It really helped she had one to chase and she rally let down for me. To be honest, she had a little look around when she got to the front. Spanks, pictured winning her maiden at Bendigo last year, has now won two of her seven starts and looks capable of winning again. Her dam is a half-sister to dual Group 3 winner Sharnee Rose and this is the immediate family of Group I winner and successful sire Snippets.